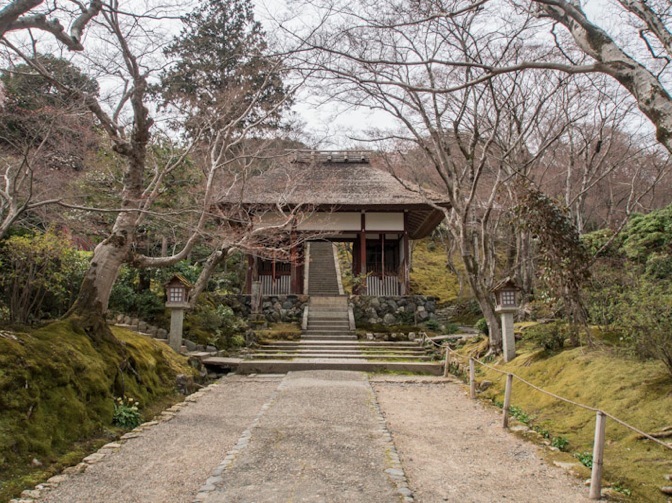 Arashiyama is known for its large numbers of shrines and temples and one can probably spend days exploring those. So we had to limit ourselves and just select a few to visit. After the Tenrujii Temple we decided to go and see a quieter temple, the Jojakkoji Temple. 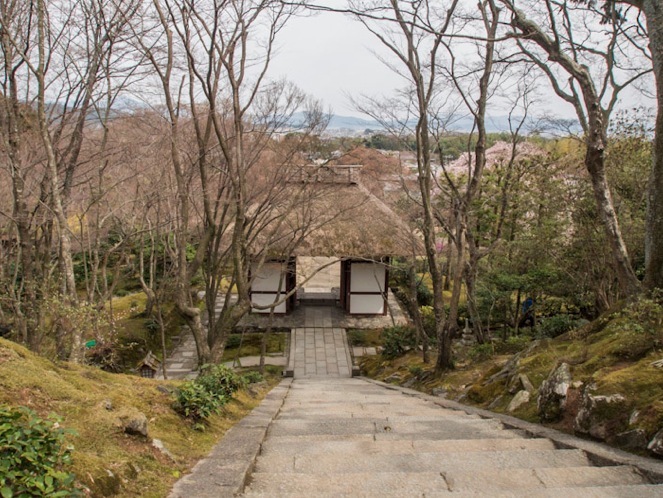 It’s mostly known for its view over Arashiyama and Kyoto. 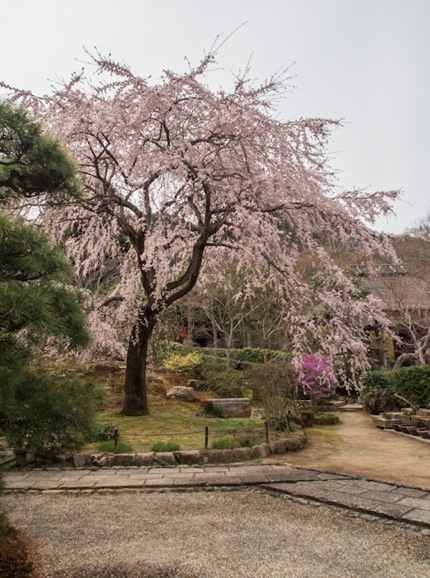 Jojakkoji was the final home of Empress Dowager Kenrei-mon-in, a principal character in the Tale of the Heike, one of the most important works of classical Japanese literature. It is said to have been built as a nunnery and has a history reaching back to the 6th century. The temple’s principal treasure is a statue of the Jizo and a pagoda surrounded by Japanese maples. The temple is built halfway up the mountain, so be prepared for some huffing and puffing, and the grounds are quite large. But we were duly rewarded for our efforts because the view is beautiful and the temple grounds are so quiet. It is a nice change from the busy streets of Arashiyama. Plus there were some lovely blossoming cheery trees in the garden. In autumn there will be lots of red leaves on all the maple trees – another breathtaking site. 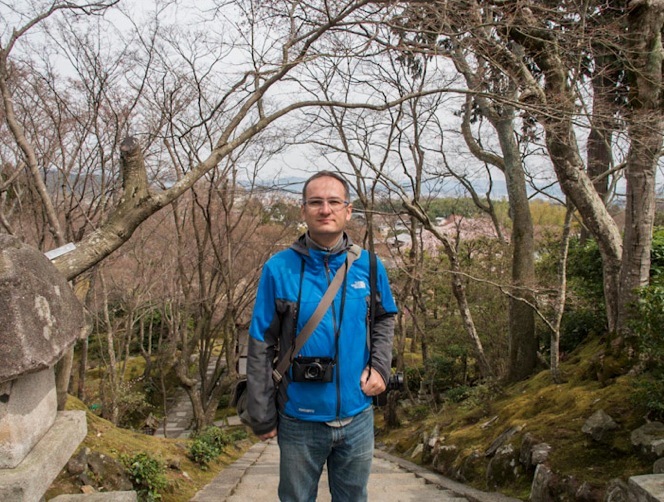 There were only very few other people around – I guess that’s because the temple is 15 mins away by foot from the bamboo forest and other key sights in this area of Kyoto.